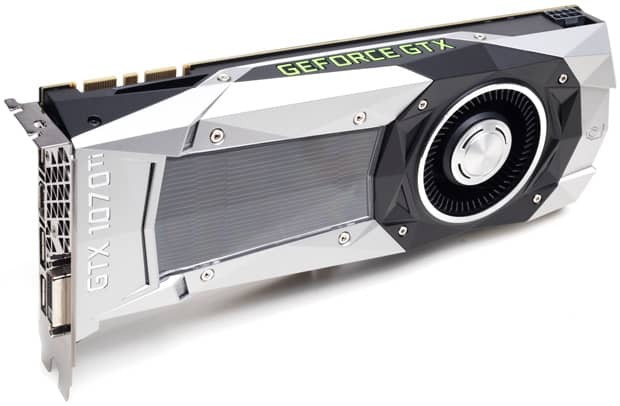 The Nvidia GTX 1070 Ti was released in 2017 as an updated and upgraded version of the GTX 1070, offering better performance, albeit at a higher price tag. It used to be a great high-end prospect back then, as it performed on par with the original GTX 1080, but with the RTX 2070 in the picture, its value is rendered a bit dubious. 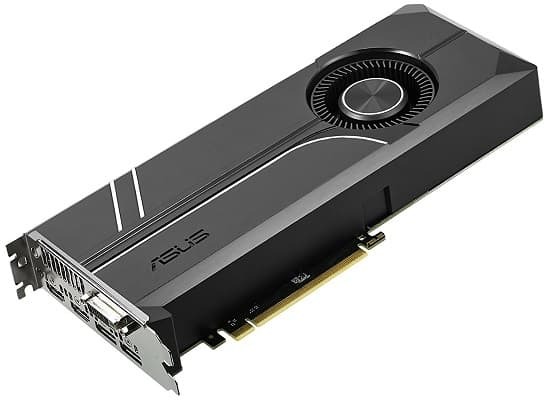 However, if you’re not pursuing the latest and greatest, the GTX 1070 Ti is actually quite affordable and a great way to tackle 1440p, as well as 4K gaming. 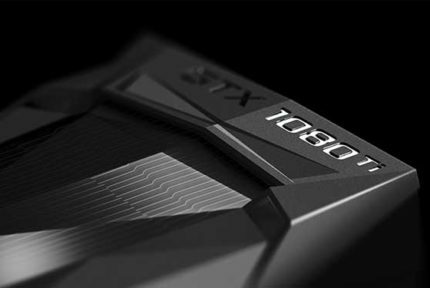 So, without further ado, here are the best GTX 1070 Ti models currently available. Many of them are on discount now, so don’t pass up an opportunity if you’re looking to upgrade your PC soon! Zotac is one of the youngest but also one of the more reliable Nvidia partners, known for manufacturing excellent GeForce cards, as well as some additional hardware. We’re kicking this list off with a Zotac GTX 1070 Ti Mini, a highly compact graphics card, at least as far as high-end graphics cards are concerned. Zotac has a “mini” version of every Pascal GPU, from 1050 to the 1080 Ti, and the 1070 Ti is no exception. 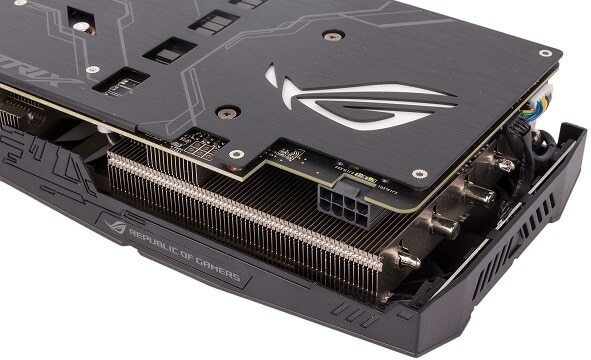 However, unlike the low-end and mid-range graphics cards that prioritize compactness, this one comes with dual fans instead of the usual single-fan design. While this makes it a bit bulkier, it is still a proper high-end GPU that’s wholly capable of fitting into Mini ITX cases. Because of this increase in size, the exterior bulk is fairly minimal, and the card comes complete with a backplate. The most obvious advantage of the Zotac GTX 1070 Ti Mini is precisely its size. Its compact frame allows it to fit into the majority of computer cases – 99%, as Zotac claims. As such, it is hands-down the best choice if you’re looking to put together a powerful Mini ITX gaming PC, or if you intend on installing the GPU in an external GPU enclosure. The card’s most prominent disadvantage is the same one it shares with every “mini” model out there: lackluster cooling. Namely, even though this particular model comes with two fans that will not struggle to keep the card cool with the factory clock settings, they will inevitably get loud under load. Needless to say, this also means that the card won’t really perform all that well when it comes to overclocking. The next card we have lined up is a bit more serious when it comes to performance: the MSI GTX 1070 Ti. 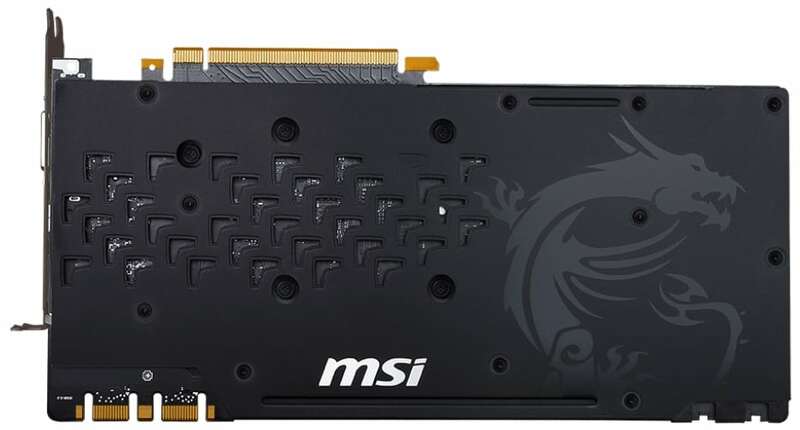 This card belongs to MSI’s well-known Gaming series of graphics cards, characterized by their great performance, solid pricing, and a design philosophy that may just be a bit too much for some people. The card boasts two massive double ball-bearing Torx 2.0 fans and comes with an attention-grabbing design with plenty of red highlights, including a set of red LEDs and an RGB logo on the side. Of course, it comes with a stylish backplate as well. Ultimately, there are three things this card has going for it: cooling efficiency, build quality, and design, although the last point is largely a matter of preference. That said, the card has solid overclocking performance and the fans are highly durable and efficient, all the while the aggressive design and the lighting help establish it as a proper gaming card. However, it is precisely this design approach that may discourage some people from buying this particular model. Sure, it looks cool on its own, but with the gaudy red highlights, the exterior design can hardly be called neutral. As such, it may not fit aesthetically with some setups. 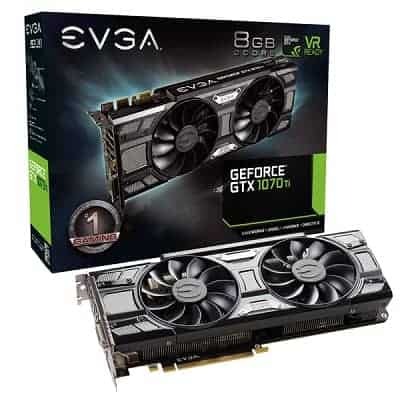 Another manufacturer that can never be overlooked when it comes to Nvidia graphics cards is, of course, EVGA. There’s no denying it, they make some of the best graphics cards out there, and while the GTX 1070 Ti SC Gaming may not be the very best model available, it still presents great value for your money. EVGA kept the exterior design virtually identical to every other card in this series, featuring dual ACX 3.0 fans and a sleek, detail-heavy exterior. 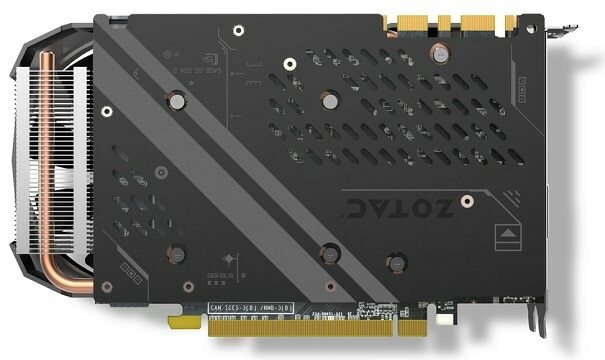 However, unlike with most high-end graphics cards, there’s no backplate involved this time around. As far as performance is concerned, this EVGA model is on fairly even terms with the above model from MSI. Both utilize dual-fan cooling, with both the ACX 3.0 and the Torx 2.0 being highly durable double ball-bearing fans. There are no major performance differences between the two and they are fairly evenly priced at the moment. An area where they do differ, though, is design. Obviously, EVGA’s sleeker and more color-neutral design still manages to give off that same “gaming vibe” as MSI’s model, but without being too conspicuous about it. 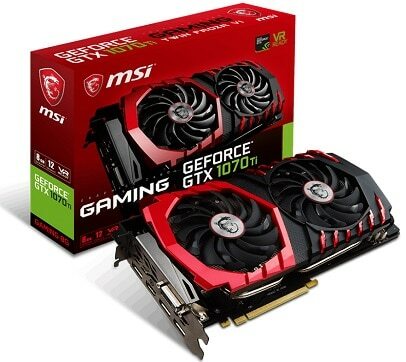 However, it has no RGB and no backplate, the lack of the latter being quite unusual for a card in this price range. So, in the end, picking between one of these two cards will come down entirely to your preference in regards to exterior design. If you’re looking for a more performance-oriented solution, you’ll be interested in what comes next. 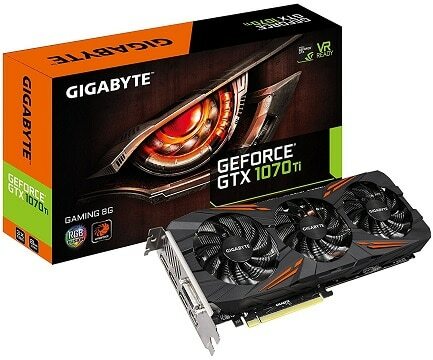 With the next graphics card, we move onto Gigabyte, yet another versatile and highly-renowned hardware manufacturer. The card in question is their GTX 1070 Ti Gaming model, and it is a superb card on virtually every front. The card boasts the recognizable Gigabyte design with orange stripes on the front and with three striped Windforce fans that, combined with the card’s massive heatsink, enable excellent heat dissipation. Of course, the card comes with a stylish metal backplate, and the manufacturer didn’t skimp on the RGB either, even though it is a rather modest implementation, restricted to the Gigabyte logo and the ‘fan stop’ indicator on the side. As mentioned in the introduction, this is an excellent graphics card, no matter how you look at it. 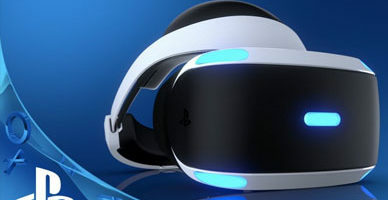 From a performance standpoint, it should be fairly obvious from the triple-fan design that it can outpace the smaller models and support some serious overclocking. The build quality is on point, too, as the card is built to be durable and long-lasting. As for aesthetics, the design is actually quite minimal, so the card will have no trouble fitting in most builds. The only problem with this card is one that inevitably comes with every triple-fan model, and that’s the size. It is quite a large card and will only fit ATX or eATX cases, so if your case is smaller, it would be best to ensure that it can house this giant beforehand. 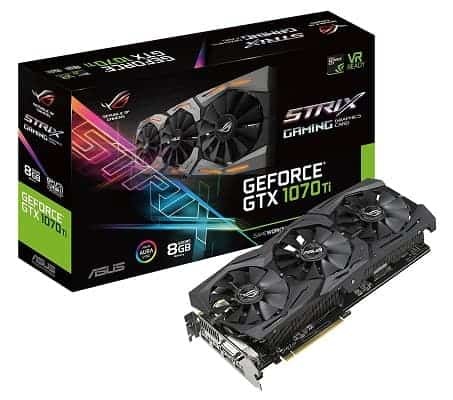 Of course, how could we talk about gaming graphics cards without mentioning one from Asus’ recognizable Republic of Gamers brand – the RoG Strix GTX 1070 Ti. And if you’ve ever encountered a RoG Strix card (and you probably have), you know exactly what to expect. This model is a massive triple-fan graphics card, sporting a minimal black exterior, a stylish metal backplate, complete with extensive RGB lighting that covers not only the stripes on the front but also the RoG logo on the backplate. To put it simply, this is the card to go to if you’re looking for a top-of-the-line card that you can overclock and squeeze the most performance out of. This model simply has it all: durability, aesthetics, and performance. We do have two qualms with it, though. The first and perhaps the most obvious one is the price. 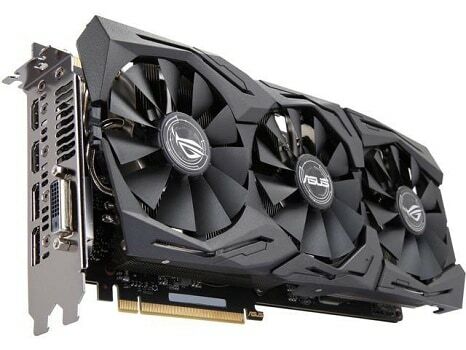 Even with the recent price cuts and discounts, the Strix GTX 1070 Ti is on the pricey side, although still quite a bit cheaper than the RTX 2070. Then, there’s also the unusual choice of ports. As you can see, most of these cards come with three DisplayPorts, complemented by a single HDMI and a single DVI port. This one, however, includes two DP and two HDMI outputs, which might present an issue for those with triple-monitor setups. Apart from that, there’s also the same old shortcoming as with the above Gigabyte model, and that’s the sheer size of the card that prevents it from being installed in smaller cases. As for the final entry, we have something a little different. 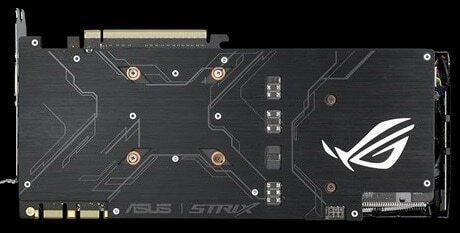 It is another Asus card, although it is not a Strix model. 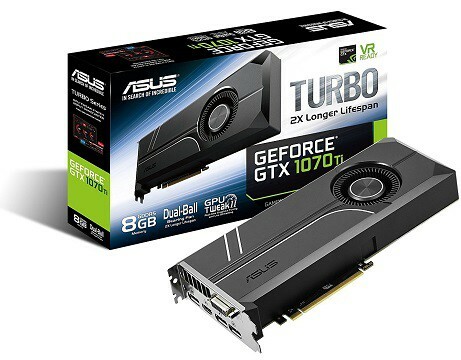 Rather, it is the GTX 1070 Ti Turbo Edition – a blower fan variant. This type of cooling is not quite popular with GPUs (more on that below), although blower fans do have their merits. It is obvious from the very first glance that Asus took a different approach with this model when it comes to design: no aggressive gaming aesthetic and no RGB lighting, just a beautiful, minimal exterior that will blend seamlessly with virtually any build. Now, don’t be fooled by the clean exterior: this is still a gaming graphics card, and it can keep up with both of the above models when it comes to overclocking. However, the blower fan has some advantages and disadvantages of its own. Namely, there’s one thing that all blower fans have in common, and it’s that they’re loud. After all, it is only a single fan pulling air in and blowing it out of the back of the card, so it has to maintain a rather high RPM. So, while this card will rival the above two in terms of performance, it will be quite a bit louder. However, even so, blower-equipped cards are great for cramped cases with poor airflow since, as mentioned above, it features a closed exterior and blows the hot air out of the back of the card and out of the case. Picking a component is never easy, so if you’ve opted for a GTX 1070 Ti, you still need to pick the right model for your needs. In this section, we will be taking a look at some of the important features that you should keep in mind before making your pick! When it comes to air-based cooling, there are two ways to go: open-air coolers or blower coolers. Open-air cooling is the most common in mainstream graphics cards, and it is arguably the best solution overall. An open-air cooler utilizes anywhere from one to three fans to pull cold air into the heatsink, pushing the hot air out. Now, the problem with open-air cooling arises when the case has poor airflow and/or lacks case-mounted fans. Namely, while the card remains at acceptable temperatures, the excess heat can easily build up inside the case, thus potentially leading to some other components overheating. This is where blower fans step in. They are usually found in reference cards, and they differ in that they only use a single fan and a closed exterior. This way, any air pulled into the heatsink is expelled through the back and out of the case. And while this is great for cramped cases with limited airflow, blower fans can get quite a bit louder than open-air coolers with multiple fans. With that said, it should be fairly obvious which type of cooling is the best solution for you based on your case. If it is a spacious case with an extra fan or two, an open-air card would be the best way to go. On the other hand, if you have a smaller, more cramped case, a blower would be a better choice. So, we’ve compared open-air coolers and blower coolers, but when it comes specifically to open-air coolers, what does the number of fans indicate? Well, as said above, open-air coolers utilize either one, two, or three fans. As you’ve probably already noticed, there are no single-fan cards on this list, as they are reserved for weaker GPUs, something that the GTX 1070 Ti definitely isn’t. Single-fan cards have the advantage of being extremely compact and often a bit cheaper than cards with more fans, but there’s no point focusing too much on them for this guide. Dual-fan cards tend to be the best middle ground for most cards, as they usually manage to strike the best balance between size, cooling efficiency, and noise levels. However, in the case of high-end cards, triple-fan models tend to be a more appealing option due to the increased cooling power, and let’s be real – if you’re buying a GTX 1070 Ti, you’ll want to push it to its limits. As mentioned in several entries, the main problem with triple-fan cards is that they take up quite a bit of space, so they can only be used in ATX or eATX cases, for the most part. And ultimately, we have the ports. 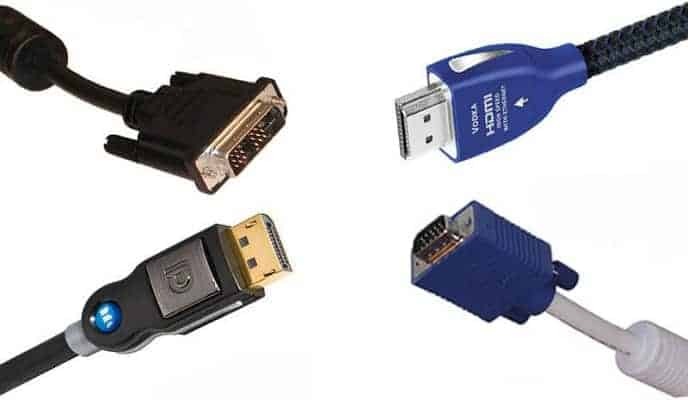 Modern GPUs and displays utilize either DisplayPort, HDMI, or DVI as a means of interfacing with one another, though VGA ports are still present in some low-end models. The key factor to keep in mind when deciding which port to use is their maximum supported resolution, as well as the maximum supported refresh rate in a given resolution. DisplayPort 1.4 is definitely king in this regard, as it supports 8K at 60 Hz, 4K at 120 Hz, while QHD and FHD can both go up to 240 Hz. HDMI 2.0 is a bit more limited, as it can only do 60 Hz in 4K and 120 Hz in QHD and FHD. DVI doesn’t quite keep up, as it can only do QHD in 60 Hz and FHD in 144 Hz. As such, it is still a viable connector for the GTX 1070 Ti, although both DisplayPort and HDMI present a better choice. At the end of the day, if we had to pick the single best GTX 1070 Ti, we’d have to go with the Asus RoG Strix model. It is by far the best card here, as far as we’re concerned, owing to its beautiful design and top-notch performance. True, it may be on the pricey side, but if you’re already getting a GTX 1070 Ti, why fall a few dozen dollars short of a full gaming experience? But of course, not to diminish the value of the other cards listed here, as they are all perfectly viable choices in their own rights. If you’re on a tighter budget or are looking for a more compact version, it should be fairly obvious which models might be better suited for your needs.